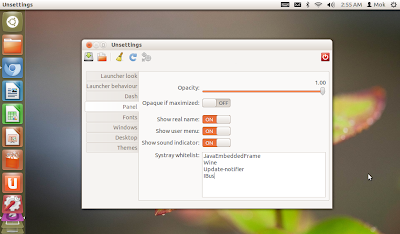 Ibus indicator does not show up on Ubuntu panel system tray at the next system startup? You can fix it either by using command line or tools with graphical user interface (GUI). The command above will whitelist all applications including ibus to be shown on the systray. Once you run the command, log out and then log back in. gsettings set com.canonical.Unity.Panel systray-whitelist "['JavaEmbeddedFrame', 'Wine', 'Update-notifier']"
Open Unsettings and click on Panel tab. 1) Add "IBus" into Systray whitelist. Or, 2) replace everything with "all". The command line work for me. I did all the things you said but iBus still doesn't come up on startup. I think the problem is the daemon process won't auto start, though I've set iBus as the input method in the language support settings. That's weird. Is the ibus-daemon running in system background processes? Try add ibus daemon into Startup Applications and see whether it autostarts. It won't auto run if I set input method as iBus. Of course it will run when I put it in the startup applications. I remember in the previous versions, as long as I set the default input method, it will auto start. Yes, it used to auto starts too in older versions of Ubuntu after I set ibus as default input method. 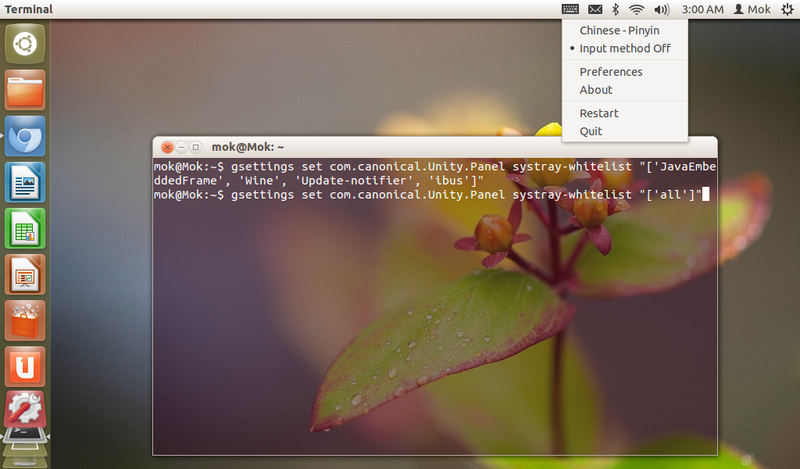 On Ubuntu 12.04, I have to run these commands in Terminal. Then the IBus icon begins to appear on Ubuntu panel without needing to add ibus-daemon to Startup Applications. If I didn't run your commands, I still could get it shown on panel when I manually start the daemon. I don't know why I cannot make the daemon auto startup. Better stick with the way which works for you. I would do the same thing as you did if the commands do not work. IBus daemon needs to be running in the end. Hopefully someone see this and provide a proper solution for you. Thanks so much for sharing this fix! Cheers. You're most welcome. Have a nice day. Even after installing unsettings and adding iBus ibus did not show up. Then as suggested in the error report, I installes zenity and zenity-common(sudo apt-get install zenity zenity-common). It worked. Thanks for the tips. It will be helpful for others. Hi @Chelsea=ManCity, you can try the tips by K.M. Shivakumar which works for him. Thank you very much @Day0107. It is helpful. Liked your comment. thank you so much for your comment, its quite easy ! !